While it’s only the beginning of November, the reality is that the holiday season is just around the corner, and with it comes an influx of party invites. And as the invitations start to mount, so does the uncertainty of what to wear. Not to fear, however: Just leave it to Topshop to make the stresses of planning one holiday outfit (or five) vanish. The ever-popular retailer has launched its holiday dress shop with endless options that are perfect for the season. Think of-the-moment slip dresses, velvet LBDs, and silk numbers that are bound to make a statement. Whether you’re going to your office holiday party, hosting a secret santa party or meeting friends at a pub, there’s a dress for every occasion. Ready to get a head start on shopping for the holiday party circuit? Scroll down to shop the must-haves of the season—all under £110. Your work holiday party can be a tricky thing—you have to try and find something that walks the line between professional and festive. Plus you’ll no doubt have to get changed at the office, so you need a desk-to-drinks kind of situation. Just because you’re attending an office party doesn’t mean you can’t make a statement. This midi-length dress is perfect for a more formal affair, and it would pair flawlessly with gold jewelry. If your office party is more happy-hour friendly, then go for a fun yet chic ensemble like this asymmetric black number that gives you freedom to play up your accessories—namely your shoes. When it’s the holidays and you’re with your friends, you have the freedom to experiment with your head-to-toe look. This is when you can bust out those sultry boots or out-there dress. 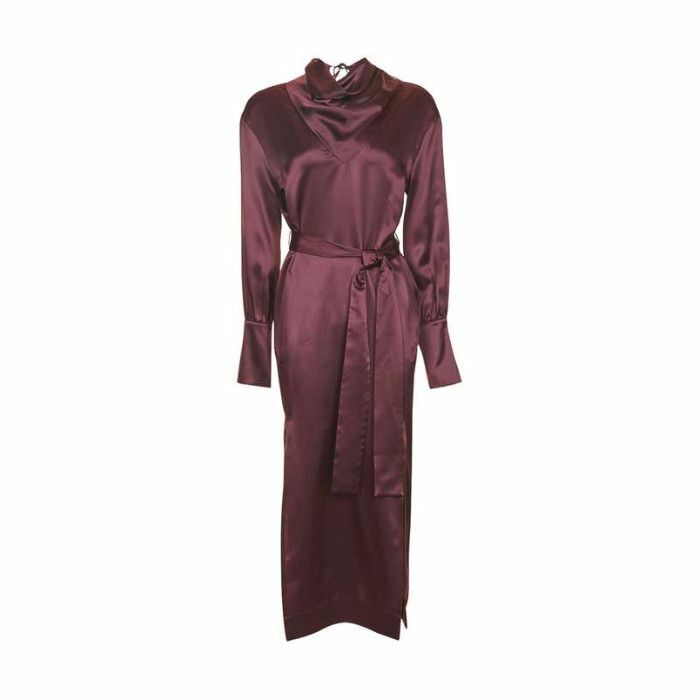 Style this velvet dress with a pair of over-the-knee boots for instant edge. A classic red dress means you can play up your jewelry. Go for long gold earrings, and layer on a few chokers for the perfect on-trend look. If you get an invite to a holiday party at a pub, you know that it’ll be low-key and casual, but that doesn’t mean you still can’t have fun with what you wear. Slip dresses are perfect for layering. Add a long-sleeve black turtleneck underneath and a pair of white sneakers for a low-key look. All this blazer dress needs is a pair of slip-on mules and sleek pulled-back hair. For this occasion, you want a knockout dress that you still feel comfortable in (even after endless mince pies). Channel all-out glamour in this cold-shoulder slip dress, point-toe heels and a bold red lip. Tinsel is as festive as you can get, while the wrap style accentuates all the right places—you'll feel confident dancing in this all night long. What’s one holiday dress you’ve had your eye on? Tell us about it in the comments below.